The Gran Corsa will be featured on Eurosport, a great coup for such an event and thanks, of course, to Sharp Electronics who are sponsoring cycling on Eurosport. There are talks underway for media coverage or a documentary about my personal ride of the full Giro route, I hope to have some updates over the coming months. My most famed sighting was a “Denis Menchov” topple going up the Ventoux for the BBC. 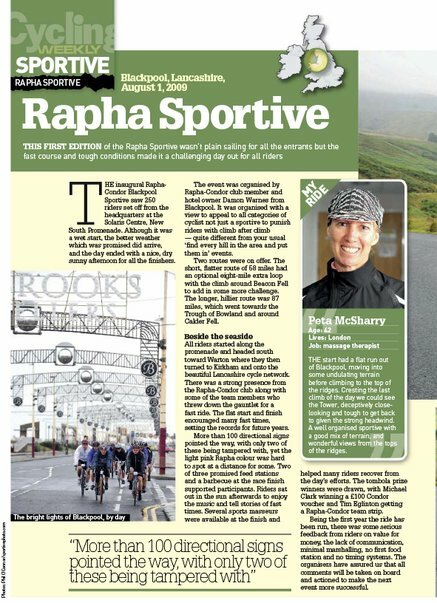 Having been involved with Rapha for the Cingles du Mont Ventoux, we took part in their Sportive in Blackpool, which featured in Cycling Weekly. Cycling. tv ran a weekly program called Innertube, part interview and part turbo race, I went head to head with Yanto Barker, as feared I was nowhere near the numbers he pushed out, but I did make it into the top 5 for the ladies.